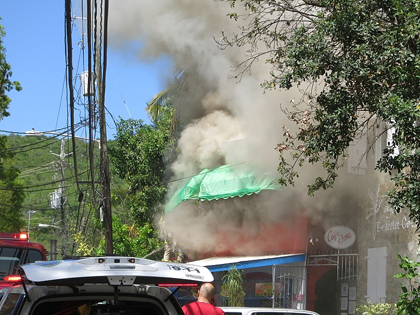 CRUZ BAY – Firefighters in St. John responded to a two-alarm blaze in Estate Enighed early Christmas morning. Two units from Zulu Company got the 911 Emergency Call at 2:26 a.m. Friday that the house at #7-7 Enighed was engulfed in flames. When firefighters arrived, they surrounded the one-story residential structure and were able to prevent the fire from spreading to nearby houses. Within 30 minutes the fire was extinguished and Virgin Islands Fire Services conducted salvage and overhaul operations. Then a safety inspection was performed by fire personnel. All units were back at their duty stations at 5:05 a.m. Christmas Day. The fire is under investigation by the St. Thomas-St. John Arson and Preventative Investigative Unit.